Ultimate Windows Tweaker for Windows 10 is an all-in-one tweaking solution with over 200 tweaks to personalize and make the Windows 10 experience yours. Ultimate Windows Tweaker for Windows 8 also available. It is fully capable of helping you make your system faster, more stable, and secure with just a few mouse clicks. “Apply Tweaks” button now applies tweaks only to the currently viewing section. Support for Windows 10 Anniversary Update: Modified incompatible tweaks and added new tweaks. When tweaks use sliders to change values, you can now directly change the values from box present in front of sliders. 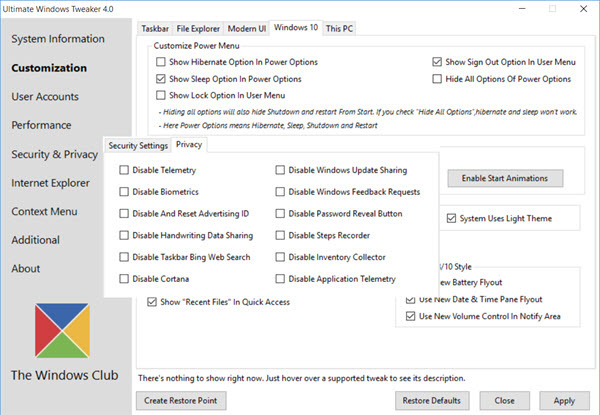 0 on: "Ultimate Windows Tweaker 4.2 for Windows 10 Final portable"